Mitchell is taking the lead on this segment of Going Home and heads home to the East Coast. Mitchell officiated a wedding for his good friends and shares stories from the beautiful event. Then Amy and Mitchell dish on what he did in Rhode Island, Provincetown and other areas in New England. 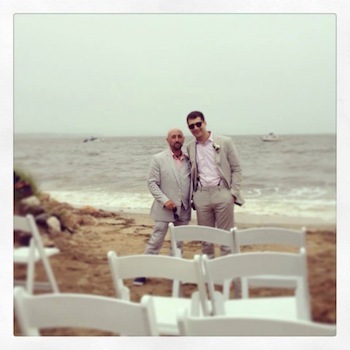 Music Featured on This Queercast:Aoife O'Donovan - "Beekeeper" and Little River Band - "Cool Change"
Photo Credit: Mitchell and the Groom on Cape Cod in Wellfleet, Massachusetts.